MagicPlot Projects contain Tables, Figures and Fit Plots. MagicPlot Project files have .mppz extension. Tables contain data in various formats. 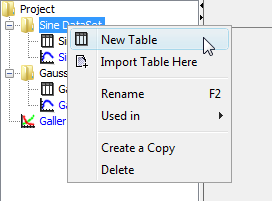 Tables which contain associated data are located in one Folder. Fit Plots are intended for non-linear curve fitting and subtracting baselines. Figures are intended to graphically represent multiple data. Typically, you need to open, edit, process, plot and fit multiple data acquired in various experiments or series of experiments within single project. Ordinarily you have the source (imported) Table and a number of Tables with derivative data, such as Fourier transform or statistics of source Table data. 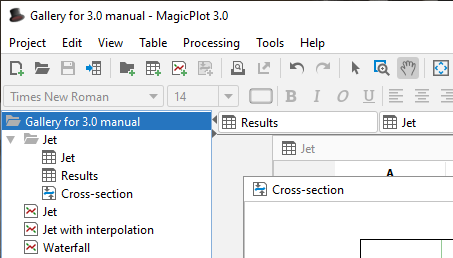 MagicPlot automatically creates a new Folder every time you import new Table. All derivative data is stored in the same Folder by default. All Plots created from Tables in certain Folder are stored in the same Folder. Feel free to close currently unused interval windows with Tables, Figures and Fit Plots. The data will not be deleted, the window will be closed only. 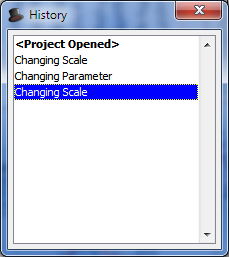 You can open the closed window by double clicking on component in Project tree. 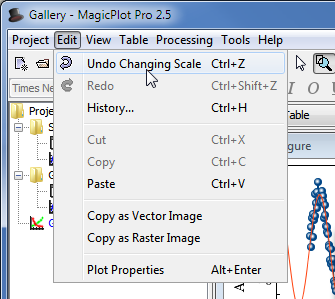 MagicPlot supports multiple steps undo/redo function with History dialog window. History dialog supports multiple undo and redo. Undone actions are marked light gray. Last saved state is set off in bold. In most cases you may start with importing table from text file by clicking Project → Import Text Table menu item. You may also use Create Figure or Create Fit Plot buttons in the toolbar. You can add new table to existing folder by selecting New Table in Folder context menu.